So I know your all wondering what I thought of this movie? 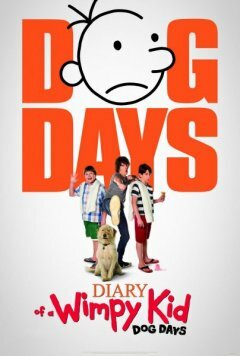 Dion and I decided that we would take the kids to the 6:40pm session at the Caloundra Cinemas tonight as we have an almost 10 year old who has loved the Wimpy kid series and was so looking forward to Dog Days coming out. Its the start of the September school holidays and we usually start the break off with a bit of a bang! Well a movie! How would I review it? Well, lets just say that I didn’t enjoy it as much as I enjoyed the first two movies in the series. Yes there were some very funny bits in it, but overall, I would give it a 5 out of 10, and I would probably say wait till it comes out on video. Actually wait till it comes out on dvd and rent it on Cheap Tuesday at the local video Ezy! As we headed back to the car, I asked Amy (our almost 10 year old) what she thought about the movie she mentioned that she didn’t like it as much as the first and second one. So there you have it! You now need to make the decision for yourself. Are you going to spend the hard earned dough and take the kids to see Dog Days, or are you going to hold out and wait for Cheap Tuesday! ← I know what your problem is…!